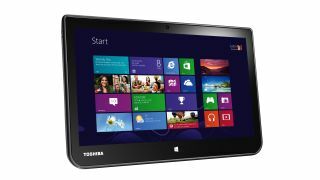 As well as the next-gen Intel Atom-toting Encore, Toshiba has also revealed a host of Satellite models at IFA 2013, all powered by full-blown Intel Core processors from the latest Haswell refresh. The Intel-powered Satellite W30t and AMD-powered W30Dt will ship with Windows 8.1 and are 13.3-inch ultra-portables featuring a backlit keyboard which is detachable so you can use the screen as a touchscreen Windows 8 tablet. While Tosh's claim that this "doubles the functionality of a standard laptop" is gilding the lily a little, these new models are decent ultraportable laptops and very powerful tablets. The W30t ships in various versions with new 4th generation Intel Core Haswell processors while the more interesting W30Dt features not only a low power variant of the AMD A4-APU but also AMD's powerful Radeon HD 8180 graphics. Storage can be specified up to a 500GB HDD (surely it needs an SSD for speed, though) while there's 4GB of memory. Connectivity comes in the form of Wi-Fi and Bluetooth 4.0 plus micro-HDMI and micro-USB – there's also a full size USB 3.0 sleep and charge port on the keyboard. Then there's the 11.6-inch thin-and-light Satellite and Satellite Pro NB10 range which are professional-use Windows 8 laptops aimed at use by schools or for those who want an easily portable second PC that has a complete set of ports and a full size keyboard. You get one USB 3.0 port (plus other USB 2.0 ones) while there's also HDMI plus VGA for connecting to legacy displays plus a full Ethernet adapter and an SD card slot. Although there's no word on pricing, this laptop will be a budget proposition as it features Intel's low cost Celeron and Pentium chips. Yep, you read that right, those 1990s names are inexplicably still around despite the processors being totally different from their predecessors. Weighing in at the 1.3Kg mark, the NB10 also features 500GB of hard drive storage and up to 4GB of memory.